1938 | HITLER HATERS THROW PUNCHES AT POLICE! 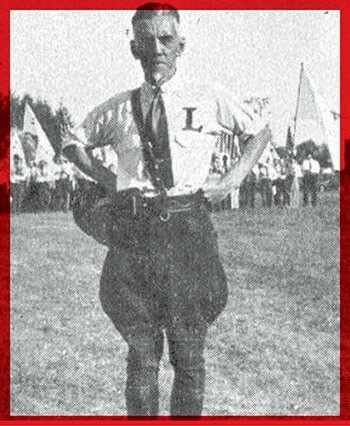 Long before a bunch of angry white dudes went marching with tiki torches in Virginia, the Silver Legion of America, better known as the Silver Shirts, incited a (considerably less) violent brawl when it brought white supremacy to Spokane. With a name and ideology cribbed from Hitler's so-called "Brownshirt" paramilitary organization, the fascist movement was founded in 1933 by journalist and short-story author William Dudley Pelley, who also worked briefly as a Hollywood screenwriter. (Two of his scripts were made into films starring his friend Lon Chaney.) The end of Pelley's short movie career coincided with the start of the Great Depression, when he became passionate about right-wing, anti-Communist politics. Three years after starting the Silver Shirts, Pelley launched a presidential campaign as a member of the fringe "Christian Party." He ran on the platform that America would prosper under his anti-minority dictatorship, a position so obviously incendiary that only one state even allowed Pelley's name to appear on the ballot: Washington, where he received more than 1,500 votes. It's obvious, then, that Pelley's group and its racist rhetoric had amassed a small but devoted following in the Inland Northwest in the years leading up to World War II. In fact, the Silver Shirts had a small administration office in downtown Spokane, and regularly disseminated pro-Nazi literature throughout the city. Their gatherings always prompted protests, with the opposition shouting rallying chants of "We don't want fascism! We don't want Silver Shirts!" and "This is Spokane, not Berlin!" On July 18, 1938, as Hitler's power was intensifying in Germany, Pelley sent Thompson Roy Zachary, the movement's national organizer, to Spokane to make a speech. Some 700 residents, a considerably larger crowd than the 200 or so folks who had come to hear Zachary, congregated outside the venue (which was, according to a 2008 blog post by Jim Kershner, called "Red Men Hall" — yikes) to voice their opposition to the Silver Shirts' presence in Spokane. The arrested protesters were soon released, and all charges were dropped. Pelley, however, wasn't so lucky: The Silver Shirts had dissolved by the end of 1941, and he served 8 years in prison on sedition charges. The original print version of this article was headlined "1938 HITLER HATERS THROW PUNCHES AT POLICE!"